In a bizarre turn of events, it seems that I’m going to spin you a preview for an upcoming title called Roundabout. The concept may seem silly, but the twist is what really rounds the game out and makes it interesting. You are the worlds first spinning limousine driver. That’s right, twirl that one around in your head for a while. A constantly rotating limousine. “Ridiculous!” you may say, “absurd!” For ’tis the thought that was gyrating circles through my mind as well. And you would be right. It is ridiculous. It is absurd. But it’s also a lot of fun. Driving a revolving limousine certainly isn’t easy, and that’s the challenge of the game. You must complete requests for passengers, taking them to their destination while performing a variety of other objectives that will curve your way. Set in 1977, the game whirls in 70’s era style, from its cheesy and hilarious live-action cutscenes, to the graphic deign of most of the elements. 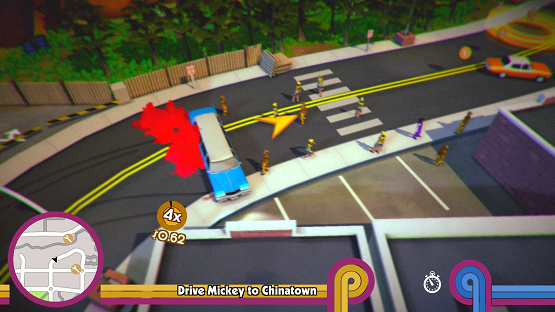 Roundabout introduces a puzzling element into a standard open world mission-based game with the rotating limo. Have to get that passenger through that narrow alley? You’ll need to make sure that you go through when the rotation of the limo is at the correct angle. How about navigating traffic? Well, you can’t stop the rotation, so you’ll have to use it to your advantage as you cruise down the street. I had a very hard time wrapping my head around how to effectively control the limo until after I had blown up a few times. After that, I was eagerly using the rotation to time my driving and make it through the levels with relative ease, while running over people and leaving bloodstains all over the town. Ending each mission gave me a list of alternate objectives that I had or hadn’t completed, meaning that there will be an immense amount of replay value to this game as there are a ton of power-ups and additional abilities that are gained throughout. You have to see the game in motion to truly appreciate the zany concept, but once you have your hand on a controller, the purpose behind this odd idea is finally realized. I wanted to keep playing, but a line forming behind me and my next appointment brought reality zooming back. I stopped spinning, took a second to regain my equilibrium, and walked away from the No Goblin booth, vowing that I’d be behind the wheel of that revolving limousine when it releases on PS4 in 2015.